The scene at Fernie Place, Fraserburgh. Police have stepped up patrols as they continue investigating the murder of a north-east dad. Gary Clampett was stabbed to death at a house in Fraserburgh over the weekend. And although police have assured the community it was an “isolated” incident, officers will be carrying out high-visibility patrols to reassure residents – while also seeking information. Mr Clampett died in a house during a “large-scale disturbance” at a house in Fernie Place early on Sunday. The alarm was raised after neighbours heard shouting, screaming and loud banging. A number of people have been taken into custody since, but nobody has yet been charged. It is hoped that during the extra patrols, officers may be able to glean some more information that helps track down the 39-year-old’s killer. 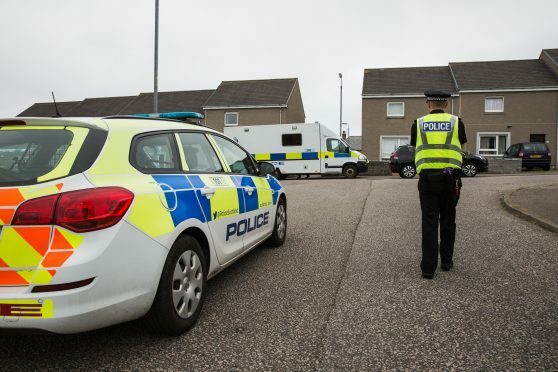 Inspector Kevin Goldie, who is based in Fraserburgh, said: “We are providing a bit of reassurance to the community following the incident at Fernie Place. “We will have a team of house-to-house officers out this evening and over the next couple of days. It is an opportunity for people who have concerns or who have information about the incident to speak to them. “There’s obviously concerns but it is still safe in Fraserburgh. This has been an isolated and contained incident and we’re quite happy that there is no wider risk to the community. Fernie Place was sealed off from about 4am on Sunday following reports of a disturbance. Although paramedics were called to the scene, handyman Mr Clampett – who was married to well-known local woman Sharon Graham – could not be saved. A massive investigation was launched, with the cul-de-sac sealed off until yesterday as forensic officers examined the area. The team, clad in white body suits, boots, gloves and masks, could be seen going in and out of two properties. Mr Clampett married Ms Graham, whose family have lived in the north-east since the mid 1990s, last year. James and Gordon Graham both took to social media to say they would miss their dad “so much”, with friends flooding them with condolences and support. The Graham family have previously been rocked with tragedy, when Ms Graham’s father, Gordon, was allegedly murdered in a flat fire on May 3, 1998. Just three years later, Ms Graham’s 18-year-old brother, Dean, was found dead in a flat in Fraserburgh. And a year later, in 2002, her oldest brother James died after a car crash near Rosehearty aged 26.